Happy Monday AMW friends! Today is another Philippine holiday in observance of Eid'l Fitr or end of Ramadan. I want to wish our Muslim friends a wonderful day in celebration of their faith! 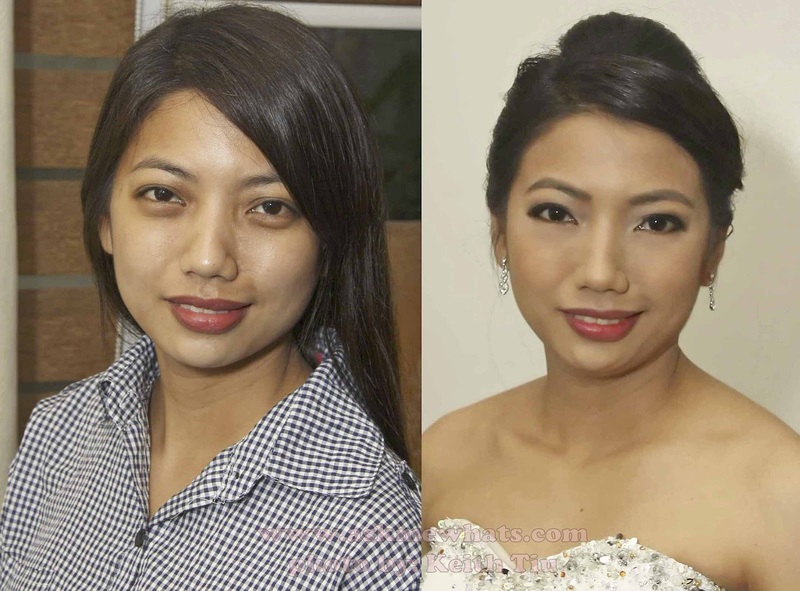 Since we are on the topic of celebration, I will share another AMW Makeovers done 2 weeks ago! 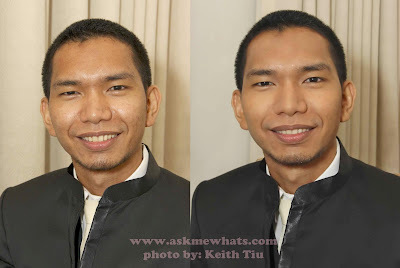 Though the groom did not request for any specific look, I know most guys would like to look like themselves on their wedding day minus the oil and sweat. Prior to liquid foundation application, I applied an oil-control primer all over his face and let it sit for a couple of minutes before I apply MAC StudioFix Liquid Foundation. With a tiny amount of a shade darker liquid foundation, I stippled the foundation specifically on areas that needs coverage. For this groom, I concentrated more on the under eye area and some random red spots. This method is done so the groom won't feel the typical heavy foundation. After making sure the liquid foundation is well blended, I set everything with MAC Studio Fix Powder foundation in NC45. 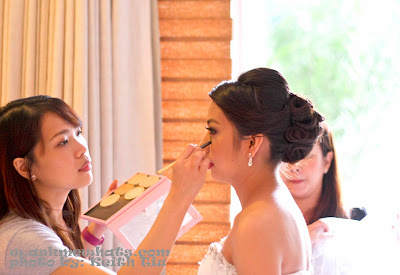 Do not forget to apply a contouring powder to create dimension especially on photos. I finished the look with a tinted lip balm for his lips to stay supple and ready for "You May Now Kiss the Bride" moment! The bride has huge set of eyes and I'm quite surprised that she requested me to make her eyes look "chinky" instead. This request was quite unusual as most brides or clients in general would request me to make their eyes appear larger! To start off the bridal makeup, I've applied Laura Mercier Oil-free Primer all over her face just to create a smooth base. The bride has normal skin and I can't seem to find any patches of dryness. Lucky her! As I waited for the primer to settle in some lines and pores, I trimmed her brows with a spoolie, eyebrow scissors and eyebrow shaver. Then after I'm satisfied with her brows, I went straight to foundation application. 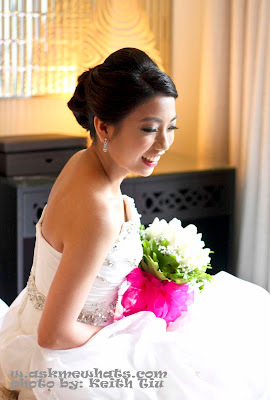 For this bride, I used Paul & Joe Creamy Foundation going one layer at a time to make sure coverage is even and the effect will be second-skin! Bride did not sleep much the night before so I concentrated on covering her dark under eye circles by using Bobbi Brown Creamy Concealer. In person, the "puff" is there as makeup can never cover eye puffiness but can only lessen the look of it (especially on photos). With heavy concealer used under the eye area, it is very important to set the area with an oil-control setting powder to prevent the concealer from sliding off! Since the request was smaller-looking eyes, I used a Matte Medium Brown Gel Liner instead of the usual black and created a tiny wing effect to extend the look of her eyes making it less round. I set the gel liner with a matte eyeshadow to smooth out harsh lines as created by the gel liner. Of course, lashes will always be needed for brides! I strongly suggest soon-to-be-Brides to start practicing on falsies! Have someone help you put them and try working on false lashes for at least half a day! If you are a makeup artist, do not forget to help the hairstylist if the veil is put on as the lashes may get caught up on veil which isn't comfortable at all! **hair done by: Kim Rodriguez. How do you like the makeover? Gorgeous! You've done a wonderful job! wow! you're a master at the art of concealing! and she looked radiant! love it! mam nikki how much po make up para sa pag eendorse sana ng mga paninda sa webpage ko?gusto ko kasi ako ung andun e.
Ang ganda nawala un eyebags. Great product!